I'm building a multi channel power amp and I am having trouble with the power supply. I'm in Europe, so I've got 230V mains and I'm running into a transformer which brings it down to 60V. The problem is that at no load, the fuses blows. As I've installed the circuit breaker, it gets tripped. Am I screwing something up? Is it a problem of having no load? Is it a problem of having no load? Yes, it might be significant. Most likely the problem is "inrush current" and this is due to saturation of the transformer core. At this point some folk may be shaking their heads and not believing this and they may point out that "surely the current will be greater when the transformer secondary is fully loaded and surely this will produce more saturation in the core?" This is the equivalent circuit of a transformer and shows other stuff like iron loss and copper losses. When the transformer secondary is open circuit, the copper losses are extremely small and can be ignored; the upshot is that \$X_M\$ receives the full supply voltage because there is minimal volts dropped across the copper loss components and leakage inductance. This means that the magnetization of the transformer is at its highest because when secondary current flows (due to load), the volts on \$X_M\$ reduce slightly due to \$R_P\$ and \$X_P\$. The voltage waveform is in black and the magnetic flux (or current) is in red. Forgive my drawing ability. Two scenarios and one produces normal peaks of current (as if the supply had been connected forever) and the other scenario causes the current to hit a big high-spot then settles down. There's nothing mystical about this - this is what would happen in an inductor if you simulated it (look at the current). If the magnetizing current peak is bigger, then so is the driving force of the magnetic field. If you looked at what the flux density is like when the ampere-turns are bigger you are likely to see the flux reach saturation and, when this happens you also draw a lot more current which in turn makes the problem bigger. This settles down after a few cycles of the power waveform of course. 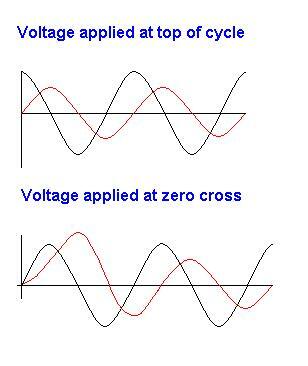 What you will probably find is that sometimes the current limit trips and sometimes it doesn't - it's all down to where on the voltage cycle you applied power to the transformer. 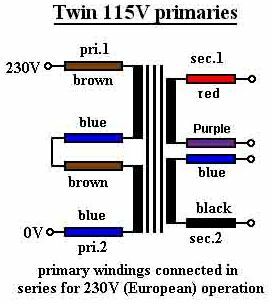 This is a guess, but you probably have the two primaries connected out of phase instead of in phase. Flip the connections of one of the primaries and see if that fixes the problem. I'm wondering what type of transformer you are using. If you are using a toroidal type, on an earthed chassis & have also earthed the securing screw with a separate wire, you will get a short, which will blow the input fuse, with or without a load on the secondary. Not the answer you're looking for? Browse other questions tagged transformer fuses or ask your own question. Why does isolation transformer protect from shock? How to reduce transformer secondary voltage?